Pan-Asia PET Resin (Guangzhou) Co - one of the biggest polyethylene terephthalate, or PET, chip producers in terms of annual production volume in southern China's Guangdong province - recently marked two major breakthroughs for its $3.2 billion petrochemical and chemical fiber integrated project in Saudi Arabia. On Oct 23, the company signed an Investment Framework Agreement with Saudi Arabia's Energy Minister Khalid al-Falih at the Future Investment Initiative in Riyadh. The FII is a major annual event in Saudi Arabia promoting investment in the country. In December, Pan-Asia partnered up with CT Environmental Group to co-develop the project. These two major breakthroughs came as Pan-Asia rapidly pushes forward preparation for the project. According to the company, most preparation for the project has been completed. Situated in the Jazan City for Primary and Downstream Industries, or JCPDI - a newly developed industrial zone in the southwestern corner of Saudi Arabia - the project will be developed in three phases. When all three phases come on stream, it will have a production capacity of 2.5 million metric tons per annum of purified terephthalic acid, 1 mtpa of PET, 200 thousand tons per annum of polybutylene terephthalate, 200 ktpa of polyester film and 200 ktpa of polyester filament yarn. The management of Pan-Asia is showing strong confidence in the prospect of the project, which received an Industrial Investment License from the Saudi Arabian General Investment Authority in August 2017. According to the company, the project is the first wholly foreign-owned petrochemical project in Saudi Arabia. "After an overall evaluation of the local market, we believe the project will bring us opportunities," said Guan Lingxiang, chairman of Pan-Asia. 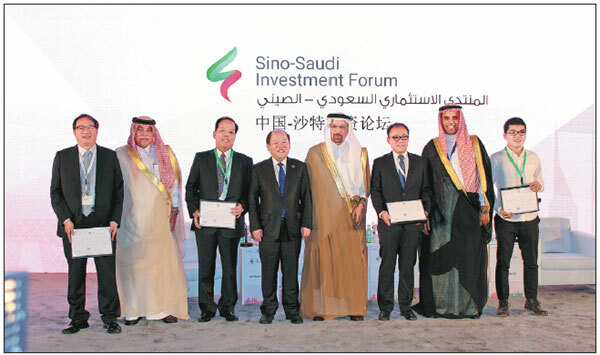 Lin Wencai, general manager of Pan-Asia Saudi Co, said that Saudi Arabia has one of the largest proven oil reserves in the world, which gives the company significant advantages in terms of energy cost saving. According to Lin, the costs for diesel, natural gas and gasoline are only about one-tenth of what they are in China, although labor and water costs are higher. Apart from lower energy costs, Pan-Asia also enjoys lower land costs and preferential financing support. Pan-Asia will maintain a long-term partnership with the largest raw materials provider in Saudi Arabia which will supply the project. The JCPDI is located at the junction of Europe, Asia and Africa, and enjoys transportation advantages from the Red Sea to the Suez Canal, allowing Pan-Asia to better serve the European, North African and Central Asian markets. According to Pan-Asia, the project was initiated in response to China's Belt and Road Initiative, which is set to support China's industrial upgrading and transformation and encourage Chinese companies to seek business opportunities in overseas markets. It is also in line with Saudi Vision 2030, an economic upgrading blueprint released in 2016 aiming to diversify the Saudi economy beyond the energy sector. The project is considered a major foreign-funded project in Saudi Arabia as well as a key project to promote China-Saudi Arabia production capacity cooperation, according to Pan-Asia. According to the company, about 85 percent of the equipment for the project will be bought in China, which will potentially drive the development of certain industries - such as the machinery, logistics and electronics industries - of the country. The project will bring about the exporting of Chinese standards, technologies, equipment and products to overseas markets, the company said. "We hope it will become a demonstrative project for the Belt and Road Initiative and be a reference point for Chinese companies seeking overseas expansion opportunities," said Lin. In Saudi Arabia, the project is expected to generate $4.8 billion worth of annual output and create 2,500 jobs upon completion. The project, designed to cover the upstream and downstream of the PET industrial chain, will also help Saudi Arabia to reduce its reliance on imported products and optimize its economic structure, according to Pan-Asia. Construction of the first phase of the project is expected to start in the first quarter of 2019. This phase is expected to come on stream in the third quarter of 2020. Pan-Asia signs memorandum of understanding with the National Industrial Clusters Development Program of Saudi Arabia, to push forward preparation of the petrochemical and chemical fiber integrated production project. Pan-Asia signs the Conditional Site Allocation Agreement with the Royal Commission for Jubail and Yanbu of Saudi Arabia, confirming land for the project. Pan-Asia obtains Industrial Investment License for the project from the Saudi Arabian General Investment Authority. Pan-Asia exchanges ideas with Saudi Arabian General Investment Authority on government incentive plans. 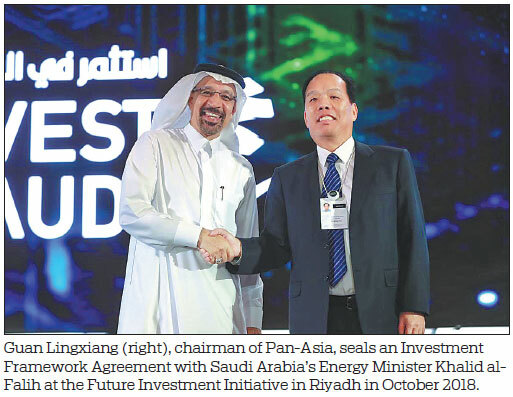 Pan-Asia signs Investment Framework Agreement with Saudi Arabia's Energy Minister Khalid al-Falih, marking a key breakthrough in the project development process. Pan-Asia partners up with CT Environmental Group to co-develop the project. Construction of the project is expected to start. Phase one of the project is expected to become operational.